On Thursday, August 9th, 2018, Joanne Bin, Executive Director of the BOLT Charitable Foundation, was the featured guest speaker at the weekly meeting of the Rotary Club of East York. Joanne was pleased to introduce the BOLT Program, elaborate on the work BOLT does in the community and explain the importance of supporting youth interested in pursuing a career in the construction trades. For over 60 years, the local Rotary club has been putting “Service Above Self” by raising funds for local and international charities. Since its inception, they have raised over $2.5 million for the community. They also play an active role in supporting Rotary International’s End Polio Now program, which has almost eradicated the disease worldwide. 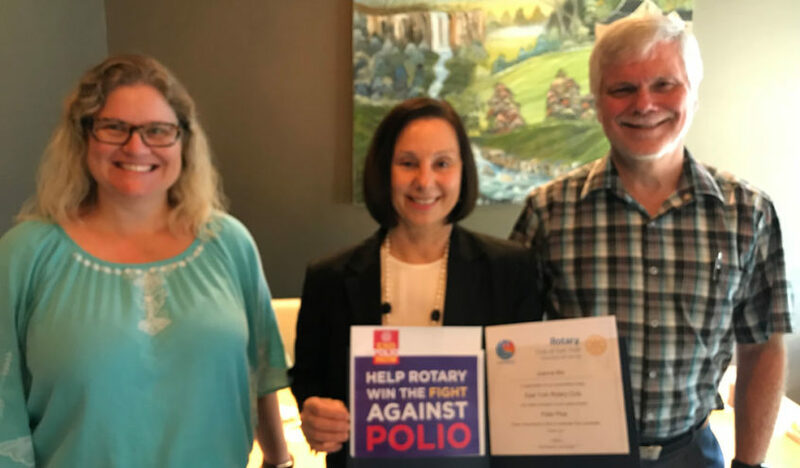 The Rotary Club of East York also supports other projects in their efforts to restore vision and to provide clean water in developing countries. BOLT‘s mandate aligns nicely with the objectives of Rotary. Both organizations are committed to supporting others and to making a tangible difference in their communities. The BOLT Road Show continues later this month with their next speaking engagement scheduled on Wednesday, August 22, 2018 at the Markham Sunrise Rotary Club. BOLT was launched by Tridel in 2009, and was established as a charitable foundation on January 1st, 2013. It started as a simple concept; to provide awareness and learning opportunities for youth associated with The Children’s Aid Society of Toronto to the field of construction. By establishing additional community, government and industry partnerships, the BOLT Program has since expanded to reach an even broader range of youth. Through various fundraising events supported by our industry and trade partners, and through Tridel’s internal fundraising initiatives, BOLT has provided over 160 scholarships for postsecondary education and training for those deserving youth interested in pursuing a career in construction.